Striking Hearts, Twin seat JF-17 b. 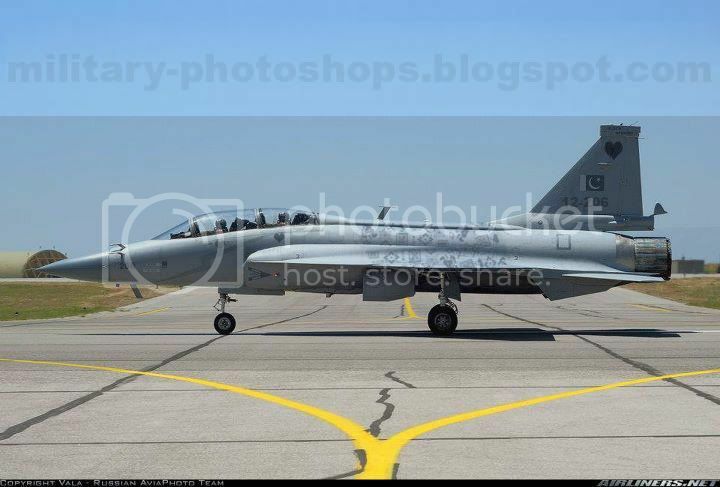 [BBN: News Desk : Defence Reporter] Pakistan Airforce No. 6 Squadron "Striking Hearts" which exclusively consists of Female Pilots of PAF , took its delivery of first JF-17 Thunder aircraft, painted in special markings . The original proposal from the Squadron Leader Miss Shagufta Karrar, on behalf of the whole squadron, was to paint the aircrafts in Pink Livery, but that request was denied by the PAF High command as it would seriously compromise camoflague during war time operations. As a sort of compensation for making it bit girly, Floral Patterns in matching color were painted on the aircraft, and squadron insignia "Striking Hearts" painted on the tail. Some sectors of media and some NGO's funded by foreign funds have suspected that the decline to paint the aicrafts pink was less of an operational requirement and more of an arrogant stunt to undermine female empowerment in Pakistan Airforce by the still Male dominant Air force High command. "If female Fighter pilots cant even choose what color airplanes they want to fly, then so much for freedom and liberty for the average females of this country." , said Begum Saba Chalghozay . PAF female pilots werent available for comments. It is absolutely right decision taken by paf.pilots should focus to enhance their operational capability and should show mature behaviour.any ways its a good news that female fighter pilots have been appointed on latest aircraft. Female fighter Pilots who are flying this JF-17 thunder, are they AMBREEN GUL and NADIA GUL. Can any one tel? ?